Yes; a generation rising up whose heart desire is to know JESUS intimately as our forefathers of old did. 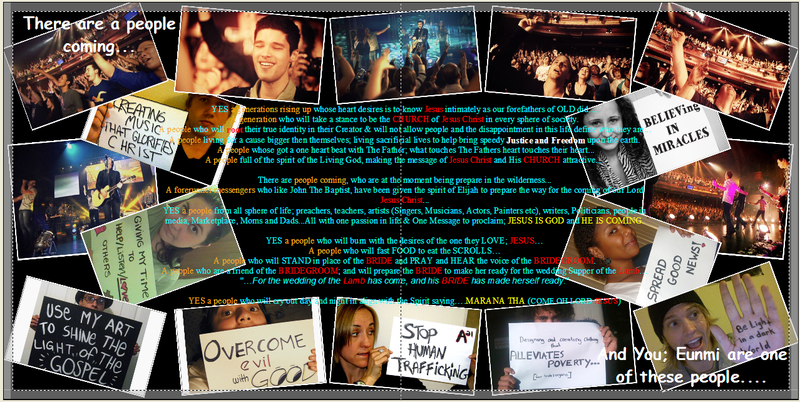 A generation who will take a stance to be the CHURCH of JESUS CHRIST in every sphere of society. A people living for a cause bigger than themselves; living sacrificial lives to help bring speedy JUSTICE & FREEDOM upon the earth. A people full of the Spirit of the Living God, making the message of Jesus Christ & His church attractive. YES, a people from all sphere of life; Preachers, Teachers, Artists (Singers, Musicians, Actors, Painter, etc. ), Writers, people in the Media, Marketplace, Mums & Dads…all with One Passion in life & One Message to proclaim; JESUS IS LORD & HE IS COMING. A people who will STAND in place of the BRIDE to PRAY and HEAR the voice of the BRIDEGROOM… …and will prepare the BRIDE to make her ready for the wedding Supper of the LAMB. “…For the wedding of the Lamb has come, and His bride has made herself ready. Rev 19″. YES a people who will cry out Day & Night in align with the Spirit saying…. MARANATHA!!! (COME, OH LORD). WOW!!! I can hardly believe I wrote this…maybe cos I have a little bit more understanding now and I’m probably seeing the Holy Spirit raising a people like these all over the world. One thing for sure…this was definitely inspired by three people/community of people that have shaped my understanding of the Church, God and His Grand plan as I can clearly see their marking in this; John Bevere, Hillsong Church & IHOPKC…for these I’m eternal grateful. Only God can do this….to take something He’s inspired me to write 5 years ago and then use it to speak to me now and alert me about the urgency of the time we live in. To Him Be The Glory!!! Remember many are CALLED but only a few will give/offer themselves to be CHOSEN. Don’t just Live Called; Live Chosen. For He’s raising up a people, a David Generation who will be a people after His heart….to gaze upon His beauty and see His heart secrets concerning the earth and therefore will be entrusted with His power to bring about His purposes…Bringing Heaven To Earth. publishing related posts to this. Continue writing superb articles! Cheers Seo Tahoe, I haven’t actually thought about writing a related article but now that I have. I’ll definitely be posting one soon.